The Marine Corps is putting together a new, mobile air-defense weapon system that's mounted on a Joint Light Tactical Vehicle and could be armed with lasers to bring down enemy threats from above. Marine Lt. Gen. Robert Walsh, deputy commandant for combat development and integration, talked about the Ground Based Air Defense Future Weapon System at a hearing before the Senate Armed Services Committee's subcommittee on seapower. Lawmakers are worried that the U.S. military's ground forces do not have modern air-defense systems capable of defeating aerial threats from adversaries such as Russia and China. "Ground forces have not experienced enemy air attacks since the Korean War; however, I am concerned that manned and unmanned aircraft, rockets, artillery and missiles pose an increasing danger to Marine units and installations worldwide," said subcommittee chair Sen. Roger Wicker, R-Mississippi. "The Marine Corps has not updated its air-defense capability since the early 1990s." Air defense is a key priority for the Corps as well as the Army, and Wicker made a point of stressing that neither service should be tackling this problem alone. "I understand that the Army faces many of the same challenges," he said. "This subcommittee believes that the two services should work together to meet similar requirements." Wicker wanted to know why short-range efforts have been progressing more quickly than a system designed to defeat medium-range threats. Walsh said that the Marine Corps has been focused on countering threats from unmanned aerial systems -- a preferred weapon of extremists in the Middle East -- but is now starting to shift focus to longer-range threats such as aircraft and cruise missiles. The Corps is developing the Ground Based Air Defense Future Weapon System, which is mounted on a JLTV and features the same radar system that the Army is using for short-range air defense, Walsh said. The fiscal 2019 budget includes $607 million to procure 1,642 JLTVs. 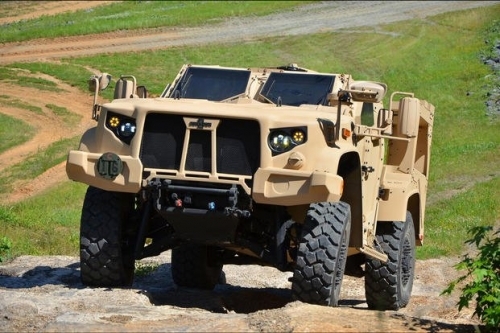 Over the course of the program, the Corps intends to replace roughly one-third of its Humvee fleet with the JLTV. The JLTV-based system relies on a Stinger missile for a "kinetic kill" capability but will feature an electronic warfare capability as well, Walsh said. "We also have a developmental program on a laser, to be able to put a laser on it," he said. "We are currently testing that with the opportunity to rapidly deploy that and demonstrate that capability." The longer-range capability has proven to be a challenge, Walsh said, adding that the Marines have budgeted research and development money into a joint effort with the Army. "We used to have Hawk missile batteries that had this longer-range missile capability that we don't have," he said. Over the next year, the Marine Corps plans to look to industry to see what systems are available for a demonstration, Walsh said. "Getting something early and demonstrating that would get the air-defense community moving toward that higher-end capability quicker," he said.